unfastens covering of bales of raw material; lifts material from opened bale, and spreads it on lattice feed of bale breaker machine; also watches proper working of lattices conveying material from machine to mixing stacks and to openers. maintains supply of waste silk, by hand feeding, to a beating machine, further to remove dust from silk received from scutcher (silk) q.v. mixes rags, to get blend of required quality or shade, by spreading layers of different materials on floor of mixing room; gathers-up material and throws it into a machine, resembling scutcher, cf. scutcher feeder (flax or hemp), which completes blending. mixes several different kinds of wool, under direction; pulls wool after blending, in preparation for scouring and willeying; in felt manufacture, piles wool into "blends," and mixes them in a shaker (willey). feeds and operates blowing machine, which opens material in preparation for subsequent processes, and removes dirt therefrom; often further distinguished according to material opened, e.g., hair blower; cf. blower (399). general terms for operative employed in blowing room, where cotton is opened and scutched; includes bale breaker, blower, breaker feeder, finisher minder, hopper feeder, lap carrier, opener feeder, opener tenter, scutcher q.v. takes cotton, in loose masses, partly cleaned, from opening machine and passes it into scutcher q.v. feeds and operates machine which opens out hard cotton waste (waste from ring frames and from reeling and winding machines, cop bottoms and other thready waste) in preparation for re-spinning, or for use in manufacture of gun cotton. (ii) feeds hopper and watches proper working of power-driven machine; sometimes specifically designated, e.g. hand hemp breaker. feeds hopper and attends to machine which buffs, rubs and removes refuse and coxirse tow from flax, in preparation for scutching process. minds machine which cleans rags, in preparation for grinding; carries bales of rags to and from cleaning machines. cleans dry waste (sweepings, etc.) by placing it in a sieving or shaking machine; or cleans waste from wet spinning room by putting it under a press to extract moisture, then into a willeying or teasing machine, and then hanging it on racks to dry; after cleaning, packs it in bales; cf. shaker, waste; willeyer. general terms for any worker employed in cotton mixing room, including bale breaker, cotton mixer, etc., q.v. feeds and operates machine which breaks up asbestos and prepares it for opening. (ii) see opener feeder, jute. minds a machine which divides hemp fibre into convenient lengths; adjusts handful of hemp, and pushes it between gripping rollers, which carry it into- contact with blade. (iii) in old mills spinning low counts of yarn, see scutcher (cotton). (ii) see finisher minder, doubler; cf. doubler (366). dresses flax, after it has been roughed, by passing it by hand over a series of finely graded hackles and switches, which complete combing out and splitting of fibres. combines work of rougher q.v. and of sorter (398) q.v. ; process is in substitution for roughing and machine hackling. puts dry flax, after it has been retted, on a shaking table, which levels ends and straightens straw in readiness for flax roller q.v. (E. Scotland) receives flax from machine hackler q.v. and combs ends by hand on small fine hackles. see scutcher (flax or hemp). a scutcher tenter q.v. who minds last of series of opening and scutching machines; keeps machine supplied with laps of cotton; sometimes to get more uniform substance, partially unrolls three or four laps and superimposes them on machine feed lattice; takes off finished laps which are now ready for carding, finisher minder, doubler; doubler (cotton blowing or scutching), doubler finisher tenter; a finisher minder q.v. working at a machine manned by a double set of minders. keeps feed sheet replenished and controls by levers a garnet machine, which opens hard twisted woollen, worsted, cotton and silk waste, in preparation for carding. feeds and operates machine, of the pestle and mortar or centrifugal type which disintegrates asbestos to shreds. feeds and operates machine (devil) which grinds rags to powder; carries rags to and from grinding machine. hackles or combs fibre, by passing it over a long-toothed hackle, or card, of coarsely set wire teeth, to remove impurities and tangles. as for hackler, fibre; sometimes also cleanses hair with soap and water, before hackling. takes handful of hair, holding one end in his hand, and drawing other end several times through hackle, a comb with coarsely set steel teeth, to loosen hair and open it out and to remove tangles and impurities; then places hair between two combs, so arranged as to hold it steady, and together forming a "card," for further combing; sometimes also washes and dries hair before hackling. as for hackler, horsehair dry, except that hackling is done while hair is still wet. hackling machine attendant; minds machine in which short and weak fibres are removed by action of steel pins; controls power-drive of machine, and clamps fibre into holders. places Manilla hemp on feed sheet of a combined hackling and drawing machine, which straightens and attenuates it, i.e. draws it out and converts the long coarse fibres into sliver, i.e., loose ropy form; guides sliver into cans or baskets ready for preparing department. places raw cotton in hopper feed of first in series of opening machines in cotton blowing room. carries cotton laps from one machine to next in order of process, generally from scutcher room to cards. places or "springs in" to position lap rollers taken off opener scutching machine, opposite feeds of finisher scutching machine, last in series of opening and scutching machines. general terms for any operative who feeds, by throwing cotton on to the lattice feed, any machine in blowing and scutching room, i.e., bale breaker, cotton mixer, opener feeder, scutcher q.v. general term covering workers attending hair preparing machines; includes opener (hair), teaser (hair), untwister (hair), willeyer q.v. directs and supervises mixing of different blends of cotton in fixed proportions, forming a mixing, or stack, which is conveyed to opening machine. mixes grades of tow in correct proportions, and takes mixture to carding machines. attends and feeds machine which loosens and cleans asbestos fibre, in preparation for carding; collects opened fibre in bags or trucks. (iii) (flax, hemp and jute); opens bales of hemp with hatchet, and loosens material, in preparation for hatching and machine hackling, entirely by hand, with a rake, with hand hammer and/or by feeding to steam hammer or to crusher machine, according to density of fibre and plant installed; cf. opener catcher, jute; opener feeder, jute; sometimes also does work of batcher (398) q.v. places wool on brattice of machine which opens it out for use in manufacture of felt. removes crushed fibre as it issues from jute opener machine; usually also assists in opening bales of jute. lays loose cotton on lattice feed of machine which opens and cleans it; sometimes specifically designated according to type of machine used, e.g., Crighton opener feeder, Crighton opener machine feeder, Crighton opener tenter. opens hales of jute, and puts or feeds heads into machine which crushes fibre, ready for hatcher (398) q.v. an opener feeder q.v. who minds an opening machine with which is combined the lap-forming part of a scutcher. opens bundles of raw silk, and separates them into smaller bundles. (ii) picks and teases cotton by hand. 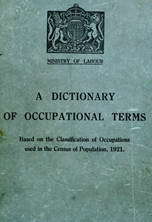 general terms covering all operatives engaged in preparing flax or hemp for carding, drawing, and spinning, including breaker, dresser, machine hackler, rougher, softener q.v. ; cf. preparer (363). places sheaves of flax straw in water in a pit or tank, until central stems have rotted and broken down enough to set free flax fibre, which grows up outside stalk; removes sheaves when process is complete and opens them out, to be dried. passes flax straw through fluted rollers of machine, which break up core of stalk in preparation for stricker q.v. roller, hemp; hand hemp roller, see softener. draws flax or hemp, . by hand, through a set of hackle pins, arranged in a wooden block, called a rougher's tool, to comb out short arnd irregular fibres and to level ends, in preparation for dressing or machine hackling. feeds and operates machine which cleans dirty wool, dirt falling through grid (screen) and being carried away by suction. minds a scutching machine, which cleans cotton and delivers it in form of laps, i.e. smooth rolls resembling wadding; sets in motion guide controlling width of lap and causing it to wind on to roller; takes off lap roller when full and starts fresh one; clears away obstructions in machine. lays together what is left of two handfuls of flax treated by buffer q.v. ; thrusts this partially treated mass over top edge of a vertical iron plate, and moves it to and fro, exposing it to beating action of revolving handles or blades, which run close against face of plate, and which complete separation of straw from fibre; turns handful of flax end for end, and opens it so as to expose all parts to beater; then folds finished mass, and puts it aside to be weighed and parcelled. feeds hopper and controls by levers a scutching machine (devil) which opens out hair fibre in preparation for carding. operates and attends a machine which loosens and straightens short fibres of silk waste, i.e., noils, and partially cleans ready for beater (silk) q.v. ; feeds machine, by hand, and removes laps, i.e. smooth rolls of fibre resembling wadding, of scutched silk. feeds "laps" to scutching machine (see scutcher), or places by side of scutcher q.v. in charge of that machine; may also remove full laps from finisher scutcher and place aside for removal to carding machine. shakes sweepings in a sieve, or in a rotary sifting machine, to remove dust and dirt; puts clean sweepings into bales or bags. softens hemp fibre in preparation for treatment by hemp breaker q.v., by passing it through fluted rollers of a machine; controls power-drive of machine, and feeds it with hemp stalks. receives flax straw as it issues from rollers; divides it up into convenient handfuls (stricks), and gives them a slight twist to make material hold together; passes stricks to scutcher q.v. tears seams, collars, etc., from old garments, to facilitate passage of cloth through blending, grinding, etc., machines in shoddy manufacture; cf. blender, rag; grinder, rag. (ii) feeds carding engine, or mixing machine attached thereto. a wool blender q.v. who throws wool from one mixing room to another through trap doors in floor. untwists, by hand, twisted hair rope made by curler (398) q.v., in preparation for carding or teasing. (i) weighs loose cotton when first rolled to form lap in lap machine, and passes it to scutcher q.v. (ii) (in cotton wadding trade) weighs out material and passes it to carding engine. throws handfuls of wooI or hair, hemp or flax tow, etc., on to brattice or other feed apparatus of willeying machine, which separates fibres, and breaks up their natural matted state, and shakes out dirt and foreign matter therefrom, in preparation for carding; sometimes also blends materials together in process of willeying. minds and feeds willey machine, which prepares rags for grinding or garnetting. see willeyer; sometimes also keeps it in running order, and is responsible for its efficiency.